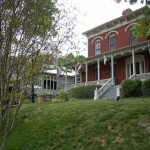 This historic home now operates as a bed and breakfast called “Thornrose House”. The B&B has a room called “Caroline’s Room” which allegedly has been a hot-spot for ghostly apparitions. The bed and breakfast is under new management as of Spring 2014.